We'd love to heard from you. Got a question? Click the button or use the contact form. Give us a call. Click below. 1. How Much Do Your Solutions Cost? Home Automation, Home Theatre, Distributed Audio Video and other service costs will vary depending on the options and solutions selected. Each system is designed and customized to each project and client. Total Home Entertainment rarely installs the same system twice. 2. What is Home Automation / Smart Home? Home Automation is a system of devices connected together via a central platform (Elan / Savant) that can be controlled locally or remotely by the user. The home automation system allows for easy access for activity based controls and can be programmed and upgraded to meet each client’s individual needs. Whether you are home, at work, on vacation, you have full control over your entire home. 3. Does A Home Automation System Add Value To My Home? Yes. A home automation system always adds value and convenience to any home. 4. Is There Home Automation Monthly Fee's? No. The home automation platforms we have selected have no monthly fee for remotely access or usage. 5. What Wiring Do I Require For Home Automation? The wiring your home automation system requires is dependent what you want your system to do. Maximizing wire potential at the building stage is best as retro-fit wiring at a later date can be very difficult, and expensive. It is best to install more wire than what is initially needed to ensure the capacity and flexibility to meet future technological needs. Each home has basic needs for each room and you may not need all of the devices in your home when you move in. However, it is essential to install that wiring while the house is being built in case you would like to upgrade or install additional components. 6. Is A Home Automation System Difficult To Maintain? No. We design our home automation systems to make to make your life easier. With any technology, there may be problems that arise, but don't worry. We are here to take care of you and provide you with maintenance and updates should you encounter any problems. 7. Are Home Automation Systems Easy To Use? Yes! When installed by a professional. The majority of professional home automation systems are now designed to be user-friendly. The interfaces given to you are very straightforward and easy to use. We provide each client with a full walk through and video manual detailing how to use their system. If there are any questions afterwards we are here to help. We offer financing*. We also accept cash, cheque and all major credit cards. *Financing based on approved credit and only applies to select projects. Thank you for visiting our website. If you have an inquiry, please use the contact form. You can also contact us using the information below. Home technology is our passion! 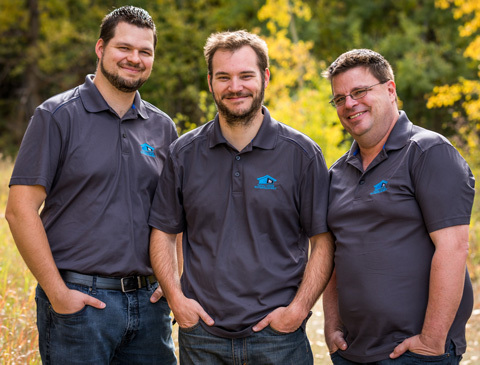 Total Home Technologies has designed and installed numerous home automation and theatre systems throughout the Alberta area. We love what we do and our goal is to provide the best performing technology solutions for your budget.